A rifle sight assists the user of the weapon to align or aim by site. They can be simple, such as an iron set which is used on firearms or they can be optical devices which are more complex. There are different sights available depending on the type of device you are using, and here we’re going to talk about rifle sights. One such sight, the telescopic rifle sight, is based on an optical refracting telescope. They can be used with any devices that require aiming but are often seen on rifles. The different sights are classified in terms of optical magnification and the lens diameter. There is also the choice between fixed and variable magnification. On fixed, you will want to choose the type of use you need prior to using the device, as you cannot alter the range of sight while in use. Variable will give you more of a range while you are using the actual device in terms of magnification and field of view. Scope Bases: these are mounted to the rifle typically with screws and are nice to use because the user can still have the option of using the iron sights, if necessary. 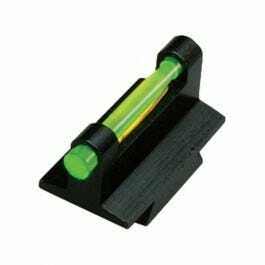 Scope Rings: you’ll need the right type of connector to attach it to the base and hold the scope to the mount. These are a little more difficult to use as the specificity needed to use this sort of mounter is essential to its use. Scope Mounting Rails: These are placed underneath the riflescope so that bases and rings do not need to be used.